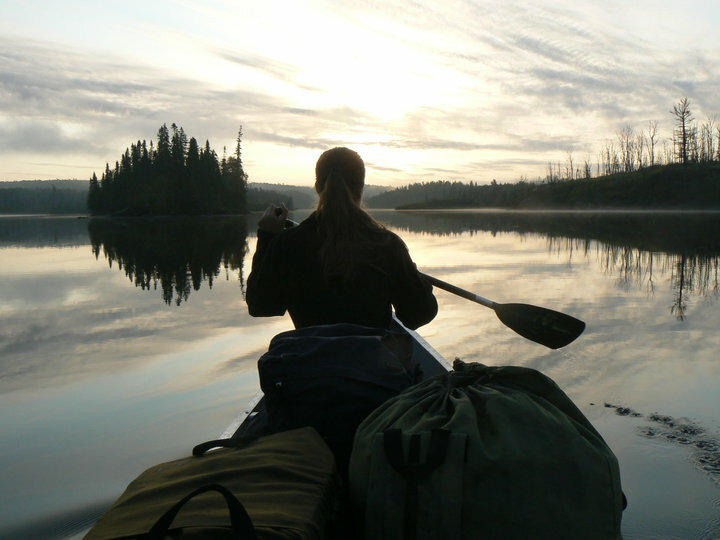 John introduced Valerie to his favorite Boundary Waters places this September. He’s a long-time guest–and, while I don’t believe he was testing their relationship…not a bit….it did remind me that it happens sometimes. Future in-laws sometimes sponsor a trip….to check out how prospective spouses fit in with the camping family. One guy covertly requested NOT to be in Bunkhouse 1 with his new date…because it held memories of his last girlfriend in Bunkhouse 1, and she hated camping. Some couples go into the woods all giddy and come out early…obviously ready for their separate ways. We see them coming and going, and have started to recognize the pattern. Sometimes it’s even worth a friendly private wager. A camping trip can make or break you, that’s for sure. I have a photo moment of the first trip I took with Andy….and we both loved the woods. I don’t know what we were fighting about—we were so young then, but the photo is of me sitting on a log, shooting daggers at the camera, obviously picking out the M&M’s from the gorp (the biggest cardinal sin). The M&M’s only……it’s a surprise that we made it anyway. Sometimes, we just have to share a private smile when the couples are very terse upon exit and hand over the credit cards separately….they won’t even LOOK at each other anymore. I should quit being so cynical. There was another married couple, former staff members, who arrived this fall just syrupy giddy, so happy to be together, she was newly pregnant, they met here—it didn’t matter if a monsoon started, they were already in heaven. Anyway, John sent a copy of a nice essay Valerie wrote for college this fall, and they have allowed me to post it with their photos here. Of course I can’t say anything for sure, but I’d guess Valerie is hooked on the Boundary Waters and John is hooked on Valerie. To witness these sparkly moments is definitely a fun part of this job. My alarm goes off at 8:30, but I am already awake. I was so worried about my first college class that I had woken up on my own. I can feel the anxiety flowing through my body as I jump out of bed. I am so nervous I am not even hungry for breakfast. I fix my hair, brush my teeth, and get dressed in what seemed like a split second. After getting ready I race to the El stop down the street to board the train to the Loop. Waiting for the El I see people hustling past me each entranced in their own situation too busy to think about the world around them. I hear the roar of the train coming and my heart begins to beat faster. “I hope this is the right train and that it’s going the right way” “What if I can’t find the right building let alone the right classroom” were a couple of thoughts pounding in my head. I barely fit into the train car because there are so many people squished into it. I feel like a sardine smashed into a can that has no more room. Unfamiliar faces are everywhere I look and I am intimidated by their confidence. In this overwhelming environment I become even more stressed about my class, about getting lost, about my professor being horrible. My apprehension skyrockets, and I lose all ability to think logically. Then it hits me. I close my eyes and regress back to a time of serenity. I am no longer on the frantic El car with my world whizzing by. I find myself in a place so peaceful that nothing would dare to disturb me. The air is so clean I take a long deep breath to rid my lungs of the exhaust and cigarette smoke from the city. My mind is calmed by the soft sound of the water. The gentle stroke of the wind loosens my nerves, and the taste of untainted air relaxes my racing heart. I am sitting on a rock right off our private island that we worked so hard to reach earlier that day. Our island was perfect; It had magnificent pine trees flourishing all over, and a charming spot to share our meals, and a swimming area that would have made an otter jump for joy. I have caught the sun just as it sets down behind the trees.The magnificent colors of orange, purple, pink, and blue blend together to make a sunset that is worthy for an artist’s painting. The water is so calm the only ripples are made from the mosquitoes skimming the surface for food. The warm pleasant temperature invites me to stay outside even longer and witness the beauty before me. The crickets begin singing their song of serenity. Every part of me is in complete harmony, relaxed, calm, and at ease. I forget about the craziness of the real world. 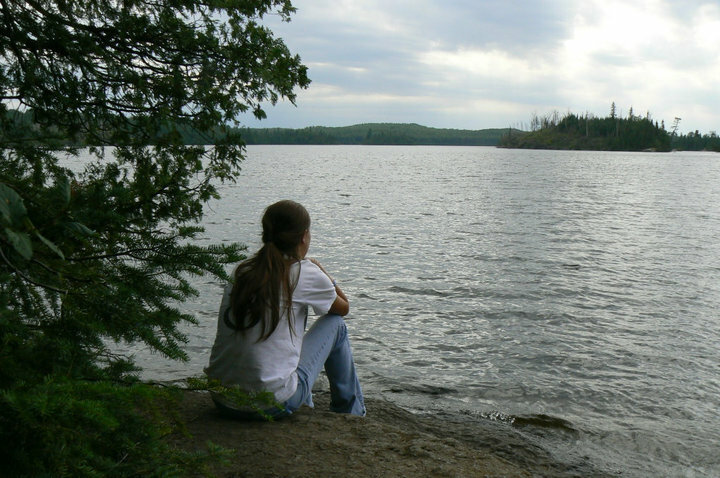 Even in the craziest of times in my life, I can find peace by remembering that moment in the Boundary Waters; that moment of tranquility. “The next stop will be Jackson”. I’m back on the El and ready to take on my first college class. I am collected and have faith that I will find my class with ease. The fear of my professor being awful has disappeared, and I am actually excited to learn. I no longer see strangers around me but other friendly faces ready to start their day. While the train is still going at full speed, I am no longer intimidated and can see the remarkable buildings as we pass them. I realize that all other freshman were feeling the same anxiety that I was, and I was thankful that I had a place to visit to calm my nerves. After my memory from the boundary waters I am relaxed and confident that I can succeed in whatever that day throws at me.